River Food Pantry is working not only to combat hunger in Madison, but to do so in a way that prioritizes the dignity of those who need its services. The River serves over 700 households every week, and is the highest volume food pantry in Dane County. The organization provides for its community through a variety of programs. Its staff coordinate five weekly community meals as well as five weekly shopping sessions, during which those in need can shop the pantry for food, clothing, and household goods. They also have a program directed at kids, called MUNCH (Madison Unites to Nourish Children at Home). This mobile service provides lunch for children in 6 neighborhoods on the North side whenever the Madison school district’s free lunches aren’t available (Saturdays and Sundays during the school year, and every day during the summer). The pantry is located on the North side of Madison, an area with the highest density of poverty and food insecurity in the city. The average family utilizing the pantry’s services comes in just 4 times per year, but a typical family of 4 could save up to $500 a month by shopping there 4 times per month. It’s an effective safety net for working families who need some extra help between paychecks or in the face of unexpected costs. Charles McLimans, the nonprofit’s executive director, emphasizes that the River is about more than just feeding people who struggle to put food on the table–it’s about building community, and providing hope and respect for struggling residents. McLimans is well-versed in nonprofit management: Prior to joining the River this past April, he served as CEO of Feeding America Eastern WI for two years. Prior to that he was the CEO for 8 years at Loaves & Fishes Community Services, a hunger relief and anti-poverty organization in Naperville, Illinois. And before that, he led a family foundation in New York City for 10 years. He’s proud to work for an organization that’s efficient at maximizing resources: 97% of every revenue dollar is invested back into food security programs. 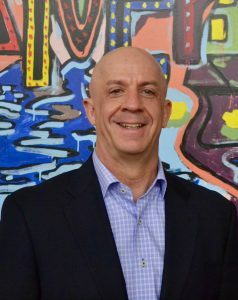 McLimans first got involved with the Wisconsin LGBT Chamber of Commerce during his time with Feeding America, and has continued his membership as part of the River Food Pantry. As a member of the gay community, it’s important to him that acceptance is part of the workplace culture. McLimans also participated in the very first year of the Chamber’s Emerging Leaders Program as a mentor, and hopes to take on another mentee in the future.